Ancient Greece was a civilization belonging to a period of Greek history that lasted from the Archaic period of the 8th to 6th centuries BC to the end of antiquity (ca. AD 600). Immediately following this period was the beginning of the Early Middle Ages and the Byzantine era. Included in ancient Greece is the period of Classical Greece, which flourished during the 5th to 4th centuries BC. Classical Greece began with the repelling of a Persian invasion by Athenian leadership. Because of conquests by Alexander the Great of Macedonia, Hellenistic civilization flourished from Central Asia to the western end of the Mediterranean Sea. Classical Greek culture, especially philosophy, had a powerful influence on the Roman Empire, which carried a version of it to many parts of the Mediterranean Basin and Europe, for which reason Classical Greece is generally considered to be the seminal culture which provided the foundation of modern Western culture. Classical Antiquity in Greece is preceded by the Greek Dark Ages (c. 1200 â" c. 800 BC), archaeologically characterised by the protogeometric and geometric styles of designs on pottery. This period is succeeded, around the 8th century BC, by the Orientalizing Period during which a strong influence of Syro-Hittite, Assyrian, Phoenician and Egyptian cultures becomes apparent. Traditionally, the Archaic period of ancient Greece is considered to begin with Orientalizing influence, which among other things brought the alphabetic script to Greece, marking the beginning of Greek literature (Homer, Hesiod). The end of the Dark Ages is also frequently dated to 776 BC, the year of the first Olympic Games. The Archaic period gives way to the Classical period around 500 BC, in turn succeeded by the Hellenistic period at the death of Alexander the Great in 323 BC. The Archaic period (c. 800 â" c. 500 BC), in which artists made larger free-standing sculptures in stiff, hieratic poses with the dreamlike "archaic smile". The Archaic period is often taken to end with the overthrow of the last tyrant of Athens and the start of Athenian Democracy in 508 BC. The Classical period (c. 500 â" 323 BC) is characterised by a style which was considered by later observers to be exemplary i.e. 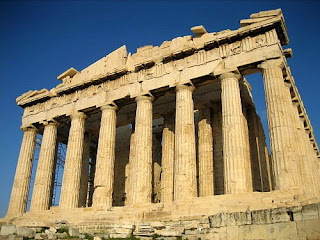 "classical", as shown in for instance the Parthenon. Politically, the Classical Period was dominated by Athens and the Delian League during the 5th century, but displaced by Spartan hegemony during the early 4th century BC, before power shifted to Thebes and the Boeotian League and finally to the League of Corinth led by Macedon. In the Hellenistic period (323â"146 BC) Greek culture and power expanded into the Near and Middle East. This period begins with the death of Alexander and ends with the Roman conquest. The Lelantine War (c.710â"c.650 BC) is the earliest documented war of the ancient Greek period. It was fought between the important poleis (city-states) of Chalcis and Eretria over the fertile Lelantine plain of Euboea. Both cities seem to have suffered a decline as result of the long war, though Chalcis was the nominal victor. A mercantile class arose in the first half of the 7th century, shown by the introduction of coinage in about 680 BC. This seems to have introduced tension to many city-states. The aristocratic regimes which generally governed the poleis were threatened by the new-found wealth of merchants, who in turn desired political power. From 650 BC onwards, the aristocracies had to fight not to be overthrown and replaced by populist tyrants. This word derives from the non-pejorative Greek ÏÏÏÎ±Î½Î½Î¿Ï tyrannos, meaning 'illegitimate ruler', and was applicable to both good and bad leaders alike. Alexander, son and successor of Philip, continued the war. Alexander defeated Darius III of Persia and completely destroyed the Achaemenid Empire, annexing it to Macedon and earning himself the epithet 'the Great'. When Alexander died in 323 BC, Greek power and influence was at its zenith. However, there had been a fundamental shift away from the fierce independence and classical culture of the poleisâ"and instead towards the developing Hellenistic culture. Î¶Î¬Î½ÏÎ¹Î¿Î½). These colonies played an important role in the spread of Greek influence throughout Europe and also aided in the establishment of long-distance trading networks between the Greek city-states, boosting the economy of ancient Greece. Ancient Greece consisted of several hundred more or less independent city-states (poleis). This was a situation unlike that in most other contemporary societies, which were either tribal or kingdoms ruling over relatively large territories. Undoubtedly the geography of Greeceâ"divided and sub-divided by hills, mountains, and riversâ"contributed to the fragmentary nature of ancient Greece. On the one hand, the ancient Greeks had no doubt that they were "one people"; they had the same religion, same basic culture, and same language. Furthermore, the Greeks were very aware of their tribal origins; Herodotus was able to extensively categorise the city-states by tribe. Yet, although these higher-level relationships existed, they seem to have rarely had a major role in Greek politics. The independence of the poleis was fiercely defended; unification was something rarely contemplated by the ancient Greeks. Even when, during the second Persian invasion of Greece, a group of city-states allied themselves to defend Greece, the vast majority of poleis remained neutral, and after the Persian defeat, the allies quickly returned to infighting. At its economic height, in the 5th and 4th centuries BC, ancient Greece was the most advanced economy in the world. According to some economic historians, it was one of the most advanced preindustrial economies. This is demonstrated by the average daily wage of the Greek worker which was, in terms of wheat, about 12Â kg. This was more than 3 times the average daily wage of an Egyptian worker during the Roman period, about 3.75Â kg. A playwright named Aeschylus changed Western literature forever when he introduced the ideas of dialogue and interacting characters to playwriting. In doing so, he essentially invented "drama": his Oresteia trilogy of plays is seen as his crowning achievement. Other refiners of playwriting were Sophocles and Euripides. Sophocles is credited with skillfully developing irony as a literary technique, most famously in his play Oedipus the King. Euripedes, conversely, used plays to challenge societal norms and moresâ"a hallmark of much of Western literature for the next 2,300 years and beyondâ"and his works such as Medea, The Bacchae and The Trojan Women are still notable for their ability to challenge our perceptions of propriety, gender, and war. Aristophanes, a comic playwright, defines and shapes the idea of comedy almost as Aeschylus had shaped tragedy as an art formâ"Aristophanes' most famous plays include the Lysistrata and The Frogs.